Roll off containers for recycling fit a slightly different bill than your typical dumpster rental for waste management. The best part of roll off dumpsters is that they come with a guarantee of delivery off-site and proper disposal procedures. All dumpsters are taken to the appropriate facility and unloaded with no inconvenience to the customer – your only job is to place the order, fill the dumpster, and wait for that annoying mess to be carried away. When you use a roll off container for recycling, you are investing in a team of professionals that knows how to properly dispose of whatever waste you need taken away. There are a number of materials and items that need specific attention because of their safety procedures. If trying to dispose of these items yourself, you would undoubtedly need to brush up on very specific waste management regulations. Materials like paint thinner, household cleaning supplies, and gardening fertilizers are commonly disposed of without much thought to the ramifications. The problem is, these materials are toxic and need to be processed differently than regular garbage. By working with the dumpster rental professionals, you don’t have to worry about it, because you will know they will dispose properly and safely. Many dumpster services offer a mail-in option for these kinds of materials. Recycling by mail is a great alternative for small-scale disposal needs. Not sure what to do with that bottle of transmission fluid that’s been in the garage for 5 years? Getting a professional to sort that for recycling is in everyone’s best interest. But for larger scale clean-up projects, a recycling dumpster is the best solution – ideal for building materials like lumber and metal that can be reused effectively. The recycling option is more popular than ever, and because of this, the process has become even more streamlined. Many businesses and residents have admitted that the need for excessive sorting had kept them from committing to recycling properly in the past. However, in recent years the process has become more simplified. 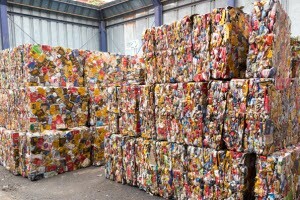 Now mixed materials can often go in the same dumpster and be properly sorted offsite. Informing your dumpster rental provider of any unusual materials is still important, but the basics like milk jugs and newspapers can be tossed in the same pile! At the end of the day, businesses and residents should recycle because it’s eco-friendly. It saves energy and reduces waste. Using a roll off recycling dumpster will guarantee that plastic, lumber, paper, and other salvageable items are deposited at a recycling center rather than a landfill. This means they will be repurposed and used again for other projects own the line, doing a favor to the environment. Click here to get more information about using a roll off container for recycling.